Abstract: Seaports are gateways between the over sea and the hinterland commerce, where different cargo types are handled at dedicated terminals. Currently, seaports are facing traffic congestion leading to a decrease in its performance. Prior to increase the existing infrastructures in terms of transport capacity between the seaport and the hinterland it is important to improve cooperation among terminals. 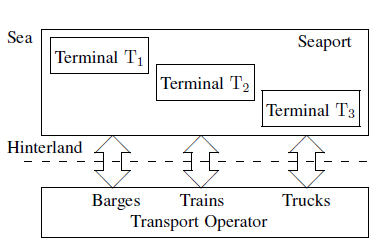 A multi-agent system to guarantee cooperation among terminals within a seaport is proposed in this paper. A control agent is assigned to each terminal and is responsible for the cargo assignment to the transport capacity at its disposal such that cargo arrives on time at the agreed location. Control agents solve in parallel an optimization problem formulated in accordance to the Model Predictive Control (MPC) strategy. Cooperation among control agents is established using a coordinator agent that updates the transport capacity assigned to each control agent based on the marginal costs provided by all control agents. The proposed framework does not require the exchange of private information and assumes an altruist behavior for all control agents. The proposed approach can perform similarly to a central approach. The framework performance is illustrated with simulation studies considering a seaport composed of 3 container terminals. Reference: J.L. Nabais, R.R. Negenborn, R.B. Carmona Benitez, M.A. Botto. Setting cooperative relations among terminals at seaports using a multi-agent system. In Proceedings of the 16th International IEEE Conference on Intelligent Transportation Systems (IEEE ITSC 2013), The Hague, The Netherlands, pp. 1731-1736, October 2013.